Outdoor Adventures | Experience New Orleans! Choose from 3 different locations around New Orleans to kayak through: bayous, swamps or rivers. Experienced guides take you on a spectacular journey through the paths less traveled for a one-of-a-kind experience! If you’re a party animal as well as a nature lover, you’ve got to experience New Orleans Pedal Barge. There are twelve pedal seats surrounding a table with built-in coolers and there’s room for six additional non-pedaling passengers. You tell the captain how hard you want to work or if you want him to turn on the backup motor and let you coast. It’s your party and you can pedal if you want to! For more than 55 years, Southern Seaplanes has been traveling above the swamps of Louisiana and its beautiful coastline, sharing their knowledge in a variety of tours for business and pleasure. 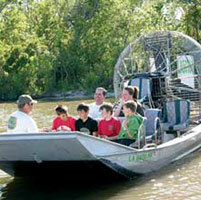 When you climb aboard one of Jean Lafitte's airboats, you're in for a wild ride. The native captain will educate riders on the Cajun way of life while gliding down the Louisiana swamp with 450 horsepower. 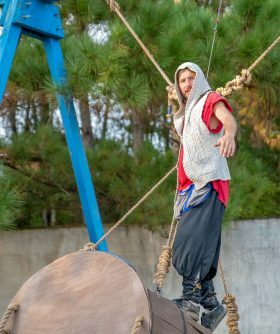 Take an exciting and fast-paced ride through the marsh bayous, wetlands and waterways surrounding the town of Jean Lafitte.Coupon Available! You'll be fascinated as you travel through natural bayous and waterways. On your tour you will have opportunities to see alligators, turtles, snakes, nutria, egrets, great blue herons, raccoons, whitetail deer, bald eagles and much more! Coupon Available! New Orleans is a beautiful location for cycling. It is ranked among the top 50 cities for cycling in the US! Whether you a re looking for an all-day cycling trip route or short routes, there are numerous trails to choose from.